My wife and I love earning credit card rewards and sign up bonuses to fund our vacations. In fact, we love it so much we share exactly how we do this with everyone that wants to learn. Unfortunately, not everyone understands the importance of playing by the rules of the credit card rewards game. Personally, I’d say if you can’t follow the rules of the game listed below you shouldn’t play the game at all. Here’s what you must do at a minimum to make sure the credit card rewards and sign up bonuses you earn won’t end up costing you money. Earning credit card rewards and sign up bonuses can get addicting. To get started, you must not have problems getting into credit card debt or other types of consumer credit debt. In fact, I would say you shouldn’t have any credit card debt at all before attempting to earn rewards. Interest rates on rewards credit cards are often higher than on no-frills, low-interest rate credit cards that people who carry balances on their cards should use. Even if you currently have no credit card debt, if you know you’ll be tempted to spend more than you should or could easily end up carrying a balance, you shouldn’t attempt to play the credit card rewards and sign up bonus game. Sorry, but it’s the reality of the game. You’re better off not paying interest and staying out of debt than you would be earning a few hundred dollars in credit card rewards. Once you know you can keep your spending under control, you must commit to always paying off your credit card balances in full each and every statement cycle. Paying your statement balance off in full each month is key to making sure you don’t pay the credit card company interest. You may think it’s acceptable to not pay your balance off in full every once in a while, but that leads to a dangerous mindset that can quickly lead to increasing credit card balances and uncontrollable credit card debt. If you can’t commit to paying your balance off in full every month no matter what, the credit card rewards and sign up bonus game may not be for you. If you ever catch yourself not paying your balance off in full, stop trying to earn rewards and sign up bonuses immediately and address the problems that led to carrying a balance. Another key to making sure you don’t pay interest or fees is making your payments on time each and every month. Making late payments is a good way to pay late fees, interest and even become subject to penalty APRs in some cases. When you start playing the credit card rewards and sign up bonus game, it’s easy to get overwhelmed as you accumulate credit cards. For that reason, it’s super important you put a system into place that allows you to keep track of when you should be getting your credit card statements each month and when your credit card payment is due each month. Check out my post on how to make sure you never make a late payment again to see how my system works. It might work for you, too. It’s been proven that people spend more on credit than they do with cash. For some reason, people are willing to spend more when they swipe a credit card than when they have to part with physical cash when making a purchase. Somehow, paying with cash hurts more and seems more tangible to most people. Personally, spending any money is a big deal to me. It doesn’t matter whether I use cash or a credit card. While the idea that people spend more using credit than cash may be true in more cases than not, it isn’t true for every single person and may not be true for you, either. 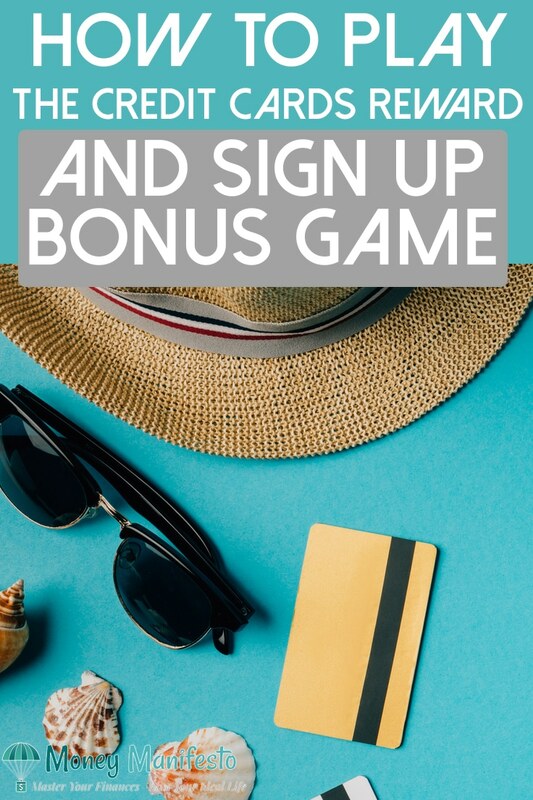 If you’re a person that would spend more using a credit card than they would with cash, the credit card rewards and sign up bonus game isn’t going to be in your best interest. Chances are you’ll spend more than the amount of rewards you’ll earn. If you’re like my wife and I and keep a strict limit on your spending regardless of whether you’re spending using cash or a credit card, then keep on reading the rest of the rules. Just like you need to keep track of when you credit card statements arrive and when your credit card payments are due, you’ll need to keep track of many other things when you’re focused on earning credit card rewards and sign up bonuses. Any other item that is helpful in managing your credit card rewards and sign up bonus hobby. Personally, I suggest setting up a spreadsheet that lists all of this information for each card you sign up for. It can be a lifesaver if you ever start juggling more than just two or three cards. While I don’t think you need to have an exact plan for how you’ll use your rewards before you earn them, I do believe you at least have to have a general idea of how you’d like to use your rewards. Having a plan allows you to choose the right cards to sign up for at the right times. It allows you to focus on airlines and hotel credit cards before a whirlwind trip around the world and cash back or travel statement credit cards before you take a trip to Disney World. Without a plan, you could end up redeeming points for less than their optimal value simply to avoid an annual fee. For instance, if you don’t have any travel purchases to redeem a travel statement credit against, you’ll probably only get half the value of your points if you need to cash them out for cash back instead. Ready To Get Started Earning Credit Card Rewards And Sign Up Bonuses? If you’re ready to start earning credit cards and sign up bonuses, here are a few posts you may find helpful to help you earn bonuses or inspire your future travel. Best Credit Card Sign Up Bonuses Available This Month – This post is updated at the beginning of every month with the latest and greatest offers. How to Get Free Disney World Theme Park Tickets For The Whole Family – I share how credit card rewards can pay for Disney World tickets. How Our Family Took A Free 5 Day Carnival Fantasy Cruise – I share how credit card rewards paid for our cruise in full. How We Got A 7 Day Carnival Cruise Completely For Free – I share exactly how we used credit card rewards to pay for a 7 day Carnival cruise.